This March 28, 2019 photo shows Mona Schaffer at The Venue Banquets in Tallmadge, Ohio. 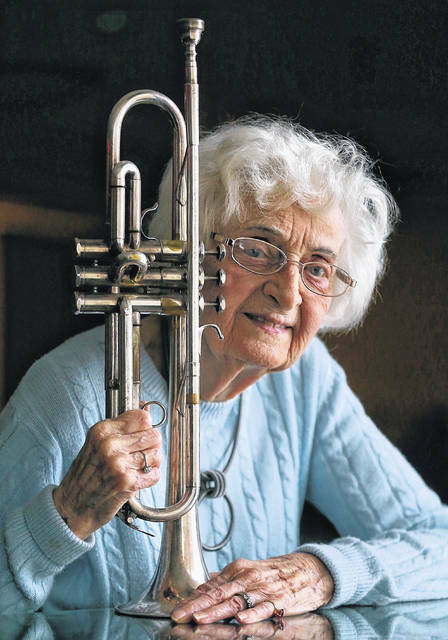 Schaeffer, a 96-year-old trumpeter, mother and grandmother, has played more gigs in more bands than most of her bandmates combined, and she’s still going strong. Schaeffer’s tenure is as unique as her entry into the Serenaders. The band was founded by the local Masons, who at the time did not allow women to perform.